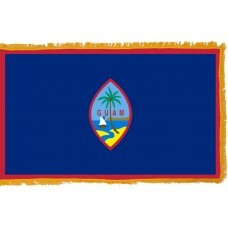 Shop for authentic Guam Flags. We offer indoor and outdoor Guam flags in durable nylon. Our outdoor flags are finished with a canvas heading, while indoor flags are finished with a lined pole hem and your choice of with or without fringe. 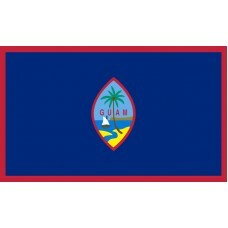 We also offer indoor and outdoor Guam flag sets. Guam is a US Territory Island in the Pacific Ocean and the flag of Guam encompasses both geographical and historical elements related to the island. It is a dark blue rectangle with a thin red border around the edge. In the center is an emblem which is said to be shaped like the stones that the island natives used to use with their slingshots. Within it the words Guam are spelt out in red over a picture of a traditional sailing boat off the bay of Agana, shown as yellow sand with a palm tree. The brown demonstrates the land mass of Punta Dos Amantes cliff in the background. The flag came into being when the wife of a US Naval officer stationed on the island during World War I was inspired to design a territorial flag for the island. It was officially adopted in 1917 and re-confirmed again as the flag of the territory in 1931. The thin red border was added to the flag in 1948 after the US re-captured the island from the Japanese after they occupied Guam for nearly three years during the World War II. The addition was to represent the blood and hardship the island endured during those times. Originally this small island was inhabited by the Chamarro people before it became colonized by the Spanish in 1521 and then came under US rule in 1898. This was after the Spanish-American war but in all that time Guam did not have a specific flag of its own. The island is closer to the Philippines than to the USA with the city of Manila (the capital of the Phillipines) being 2,600 Kilometers west of the island and San Francisco 9,300 Kilometers east. The nearest US state capital is Honolulu at over 6,000 Kilometers away. The USA has used Guam as a strategic military base in the Pacific Ocean for many years with it being key during the second world war and the Vietnam war and the Anderson Air Force base being the first base outside of the continent of the USA. It is still vital to the US today and since 2015 the re-location of marines from Okinawa in Japan to Guam has been taking place and is due to be completed in the 2020's. This will ensure that the island remains a strong US defence presence in the Pacific with 29% of the islands land area being taken up by US military bases. Having the US military bases in Guam adds to the Guam economy but it's main income now comes from tourism. The tropical climate, coral beaches as depicted on the Guam Flag along with it's Chamorro and Spanish cultural influences and varied history make it a top destination. It is particularly popular with the Japanese and South Koreans who want a taste of America without travelling the long distance to the United States. Americans also like to travel there as it is one of the furthest points they can travel without requiring a passport.